We were supposed to be heading over to Holgate next, but a visit to the Museum Gardens seems necessary. On Saturday evening I read about a Christmas attraction: ‘Enchanted trail’ Christmas attraction coming to York‘. I’d avoided the article earlier as I’m not a big fan of Christmas and that time of the year in general, and I didn’t want to think about it in early September. But once I realised it was about the Museum Gardens I was interested. I’ve written about the Museum Gardens many times in the past, including a series of pages on different aspects of the place back in 2011, and last year, in April 2016, Museum Gardens: ownership and access. The issue of ownership/public access comes up again in plans for the 2017 festive period. Or rather, it should. The local media articles about it read like free adverts, merely reporting what’s presumably a press release. Reading this unquestioning reporting I found a host of questions came to mind. As pictured above, there’s a sign on the museum wall that states that the Museum Gardens were presented to the citizens of York. 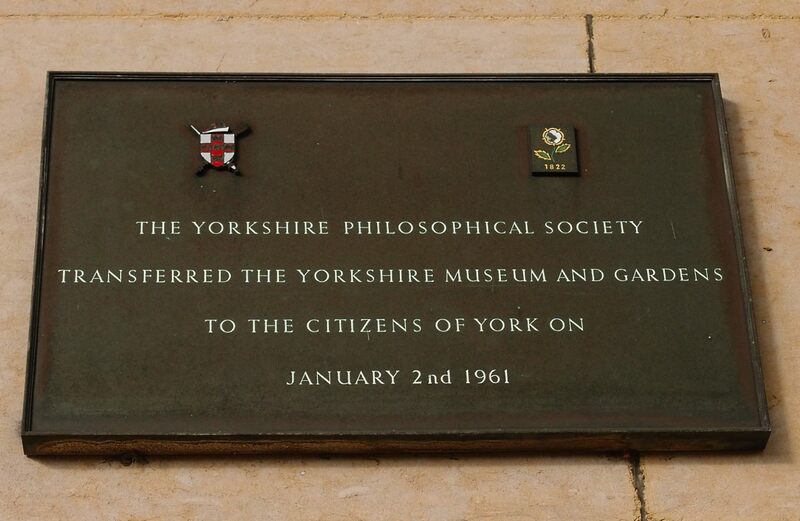 As previously mentioned, the official line/official description is that the Museum Gardens are owned by City of York Council and managed by York Museums Trust. On the surface that sounds all fine and reassuring, as both CYC and YMT are there to look after the city’s assets on behalf of the citizens. These days, for the last six years or so, it hasn’t felt to me like the citizens own the Museum Gardens, or not in the way I’d understand it. For this Christmas happening a company called Lunchbox productions, ‘Global producers of live entertainment’, in an arrangement with YMT and the city council, will be using ‘our’ park to put on an event that will see the ordinary folks unwelcome after 4pm for a period of about six weeks. In the winter months the Museum Gardens are usually open until 6pm. The Museum Gardens meant a lot to me over the decades, since I first visited in the 1970s, and fed crumbs to one of the peacocks. This place was an important part of my teenage years too. Back then it was our town park. Now it’s another part of the ‘visitor offer’. I don’t visit so often now, not in summer when it’s busy, but out of season, late in the day, I found it a fine place to sit awhile. This year, for the period of the Christmas trail, and according to the Press article, the gates will shut at 4pm. They’ll then reopen at 4.45 for the paying visitors. The paying visitors will be paying £14.95 for each adult, £40 for a family of four, plus a booking fee. Reading this I thought ‘How much? !’ The Press comments make it clear that most other readers thought the same. How many York families can afford to pay that kind of entry fee? Presumably it’s not aimed at us but is supposed to bring visitors flocking in from across the north of England, or something. Where are the records of this arrangement being made, the decision being taken, to close the gardens to the wider public much earlier than normal every day for a period of many weeks? If the park really belongs to ‘the citizens of York’ then why did we have no say in this agreement between YMT and a private profit-making company to use part of ‘our’ land? The same company, Lunchbox productions, are behind the project to put a pop-up theatre on the Castle car park, but that went to a council meeting, decided in public. Is there an equivalent process here, and a public record? I couldn’t find anything. Is there any information in the public domain about the predicted profits and how they’re going to be split? How much of it comes back to ‘us’, seeing as the Museum Gardens is ‘ours’? If this public park really does belong to the citizens of York, as that handsome bronze plaque says, then the organisation managing it needs to make its information on how it’s managing it easier for the citizens to find, at the very least. And if YMT can’t do that then perhaps they can take down that outdated sign on the front of the Museum, or add a new one underneath explaining to the citizens what our ownership rights are in 2017. There are railings around much of the site, of course, so it should be easy to see the pretty lights etc for anyone who’s interested – unless the plans include temporary wooden fencing around the perimeter. If so I hope there will be a planning application that we can all comment on. I remember being in York when The Mystery Plays were held in MG. If you weren’t a paying punter you were shown where the exits were.